Protest in Morocco, December 27, 2017. Photo from Riffijnse Kwestie's Twitter account. The massive demonstrations started around December 12 with people demanding lower electricity and water bills. However, the rallies were reignited last Friday after brothers Houcine and Jedouane Dioui died at an abandoned coal pit in the mountains surrounding the town, when the tunnel they were digging 85 metres below ground flooded. According to local residents who were interviewed by AFP, young people go down into inoperative mines to try to find something that would help them make ends meet in a place facing high unemployment rates. For eight decades, mining was Jerada’s main activity employing more than 9,000 people, France 24 reported. However, most operations closed in the late 1990s and many left the city. Those who stayed are scrambling to survive and one of the things they do is find coal illegally to then sell it to local, powerful traders who then resell the fuel at a huge profit, AFP reported. The news agency added that people accuse officials of turning the blind eye to such activities and dismissing the growing number of deaths that take place as a consequence of those operations. 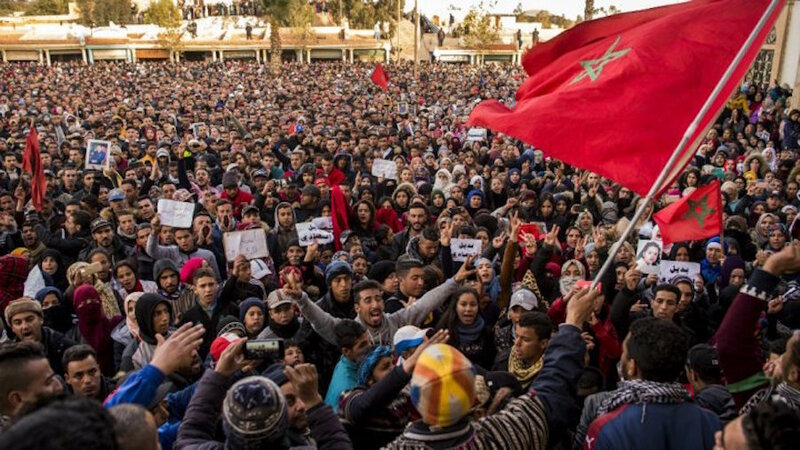 Tired of corruption, marginalization and perils, residents took it to the streets carrying Moroccan flags to signify that their protests were peaceful and, according to human rights activists, to avoid being accused of separatism.They blamed authorities for leaving them to their own fate and pressed for urgent action. Prime Minister Saad Eddine El Othmani is set to meet with Jerada’s lawmakers to "discuss problems in the region,” France 24’s newscast stated. At the same time, Energy and Mines Minister Aziz Rebbah said that his cabinet is working on solving the economic crisis by building a coal-fired power station near the city that will employ 500 people; the plant is being developed in partnership with China's Qingdao Huafengweiye Electric Power Technology Engineering Co. Rebbah’s office is also running an assessment of the area's mining potential to encourage investors to get there. Half of the population 15 years and older living in rural areas of Morocco and who have previously worked are unemployed, national statistics for the first trimester of 2017 show. Overall, 10.8% of Morocco’s workforce is unemployed. According to Global Finance, Morocco is the 75th poorest country in the world.